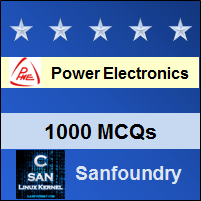 This set of Power Electronics Multiple Choice Questions & Answers (MCQs) focuses on “1-Phase-Diode Rectifiers FW-1”. 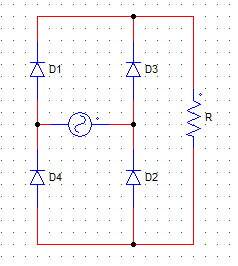 Explanation: A bridge type requires 4 diodes which are connected in a bridge, and the mid-point has 2 diodes. Explanation: It is a two-pulse rectifier as it generates 2 pulses per cycle. Explanation: Full wave M-2 type employs a transformer and two diodes. 4. In a 1-phase full wave bridge rectifier with M-2 type of connection has secondary side voltage Vs = Vm sin ωt, with R load & ideal diodes. Explanation: The voltage waveform is a pulsating voltage with peak value Vm & symmetrical about π. Explanation: Full wave B-2 type uses 4 diodes in a bridge connection. with R load & ideal diodes. Vo = (1/π) ∫π Vm2 sin2ωt d(ωt) = Vm/√2. Vs is the secondary side single winding rms voltage. 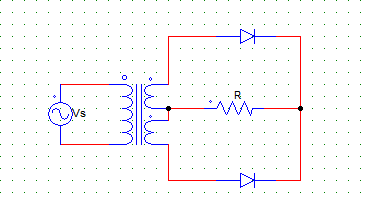 Where, for the given circuit, V(rms) = Vs. Explanation: In the m-2 type connection, each diode experiences a reverse voltage of 2Vm. 9. For the circuit shown below, find the value of the average output current. Explanation: The peak current through the diodes is same as that passing from the load. Each diode pair conducts for 180 degrees. Hence, 1/2 of a cycle. Average current = Im/2.